Portrait mode: it’s all the rage. If you’ve been comparison shopping for a new top-of-the-line smartphone lately, you’ve probably seen “portrait mode” advertised in big, bold letters next to RAM, system-on-chip speed, and other headlining specifications. But just what is portrait mode, and what does it have to do with your phone’s camera? And more importantly, how do you enable portrait mode on any phone? What is portrait mode and how does it work? “Portrait mode” isn’t a technical term — it’s marketing shorthand for shallow depth of field, or the range of focus that loses focus the further an object veers to either end of the focal plane (i.e., the plane that’s perpendicular to the axis of the camera lens). Normally, smartphone cameras, which have relatively small sensors compared to the average single-lens (SLR) and digital single-lens (DSLR) shooter, capture everything “in focus” — the background and the foreground of the image look sharp as opposed to blurry. When phone cameras snap a photo in portrait mode, though, they blur parts of the image for a neat stylistic effect. On SLRs and DSLRs, shallow depth of field is achieved by narrowing or widening the aperture (the opening of the lens’s diaphragm through which light passes through), which in turn narrows or widens the focal plane. Shooting at a wider aperture, such as f/2.0, lets in more light and achieves more “blur” in front of and behind the subject of an image, while shooting at a narrower aperture, such as f/7.0, lets in less light and results in crisper pictures. It’s physics. Camera lenses can’t focus light rays perfectly; points of light are rendered as spots on the image sensor rather than points. These spots are called circles of confusion, and when a spot falls outside a range of sharpness (depth of field), it becomes blurred and defocused. 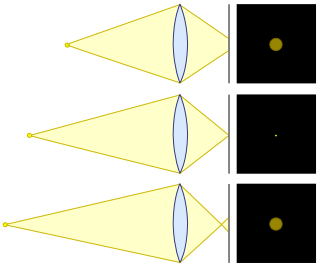 Think about it this way: lenses refocus rays of light into cones, and if a ray of light falls perfectly within the focal plane, the resulting cone focuses on the camera’s image sensor really sharply. Narrower apertures allow less light to pass through the lens, focusing the cone and expanding the range at which spots on the image remain in focus. You’ve likely heard the word bokeh tossed around in relation to portrait mode. It’s derived from the Japanese word boke, which roughly translates to “haze”, and it’s the aesthetic quality of the blur in the out-of-focus parts of a picture. Generally speaking, bokeh becomes more pronounced at wider apertures. 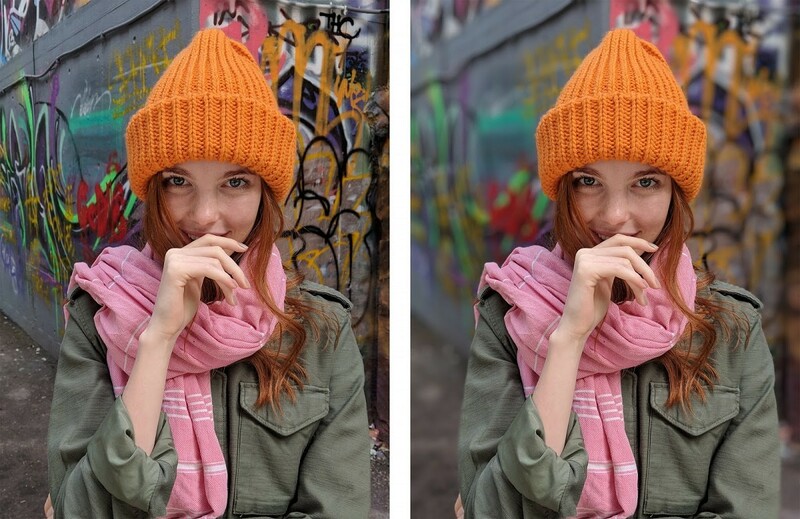 Portrait mode on smartphones comes in two flavors: dual-camera portrait mode and software portrait mode. Some smartphone dual-camera setups consist of an RGB sensor, which captures pictures in color, and a monochrome sensor, which snaps pics in black and white. The monochrome sensor works in wide aperture, recording light data that’s subsequently combined with image data from the RGB sensor to create depth of field. 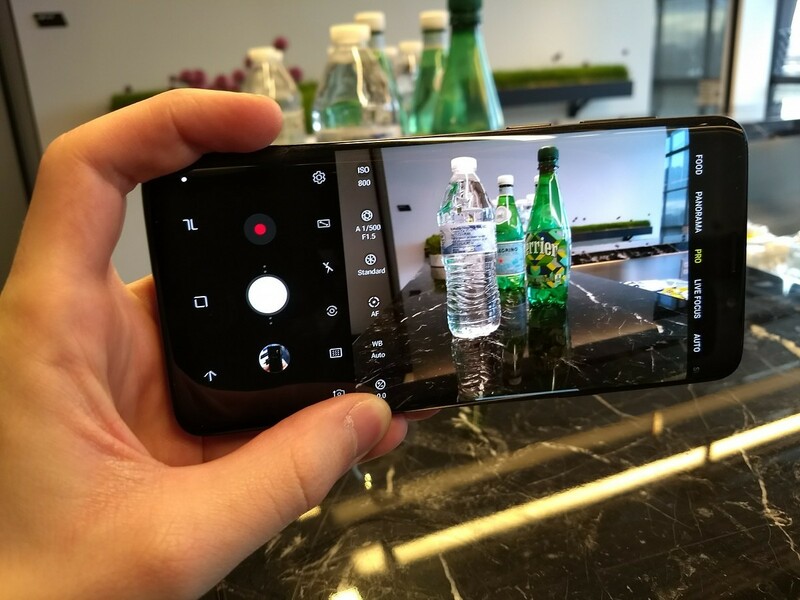 Other dual camera systems, such as those found on the Samsung Galaxy Note 8 and Galaxy S9+, comprise two RGB lenses (a telephoto lens and wide-angle lens, in the Note 8 and S9+’s cases) with different apertures. They work on the same principle: the image data from the two sensors are combined, lending a degree of depth-of-field flexibility. By definition, software portrait mode is hardware agnostic. Instead of relying on image data from two camera sensors, software depth of field filters and adjustment sliders use machine learning, computational photography, and algorithms to approximate bokeh effects. The Google Camera app on the Pixel 2 and Pixel 2 XL is one of the best (and most convincing) examples of software portrait mode. First, it captures a series of ten photographs at varying exposures– underexposed (dimly lit), overexposed (brightly lit), and levels in-between — and generates a composite image. That ensures that details and highlights aren’t lost during post-processing. Next, the Google Camera uses machine learning to identify the subject of a portrait mode photo. It’s a little complicated, but essentially, Google’s trained artificial intelligence to recognize filter photos for facial features, clothing, and skin by detecting pixel-level differences in color and edges. The result is a stencil-like cutout — a “segmentation mask” — that separates the in-focus foreground subject from the out-of-focus background. Finally, in order to mimic the way light behaves in the real world, the Google Camera app creates a depth map by combining imaging data from two sets of pixels on the phones’ camera sensors. The Pixel 2 and Pixel 2 XL’s cameras have Dual Pixel Auto Focus (DPAF) technology: each pixel is divided into two small sub-pixels that capture light from a slightly different angle, which the app uses to determine the distance of objects from the camera. Now that you have a better understanding of what portrait mode is and how it works, you’re probably wondering how to enable it on your phone. If you have a smartphone with a dual-sensor camera module, you’re in luck: Your phone likely came with some form of portrait mode out of the box. But if you’re stuck with a single-sensor camera, not to worry. Chances are there’s a first-party or third-party software alternative. The Samsung Galaxy Note 8 and Samsung Galaxy S9+ feature Live Focus, an effect that taps the phones’ dual-camera modules to simulate depth of field. (The Galaxy S9, which lacks a secondary camera, is limited to Samsung’s software-based Selective Focus mode.) Here’s how to enable it. Tap the Camera shortcut in the app drawer. Alternatively, quickly launch the app by tapping the camera icon on the home screen or by double-tapping the power button in quick succession. Tap the Live Focus button above the shutter. The camera app will prompt you to stand at least four feet away from your subject, and you’ll see a Live focus ready indicator when everything’s in focus. Adjust the degree of blur by using the slider above the shutter button, but don’t fret if you’re feeling indecisive — you can adjust the blur after the picture is taken in Samsung’s Gallery app by using the Adjust Background Blur option. An alternative mode worth mentioning is Dual Capture, which saves both a Live Focus image and a standard wide-angle image simultaneously. You’ll find it next to the Live Focus button in the camera app. The Xiaomi Redmi Note 5 Pro, Xiaomi Mi Mix S2, and Xiaomi M1 A1 boast dual cameras and software-based depth-of-field adjustment. Their portrait mode features are conveniently located in the camera app that ships with MIUI, Xiaomi’s custom Android skin. Tap the Camera shortcut in the app drawer. Make sure your phone’s in portrait orientation, and look for the portrait icon at the top center of the viewfinder. Select it. Objects in the viewfinder will suddenly appear a lot closer than before, which is perfectly normal — portrait mode stitches together image data from the wide-angle and telephoto lenses. Tap the subject you want in focus, and optionally apply filters by tapping the Filter button to the left of the Options button. When your shot’s properly aligned, you’ll see a Depth Effect notification near the shutter button. The OnePlus 5 and OnePlus 5T have dual cameras, and they’re the first in the OnePlus series to come with portrait mode out of the box. It’s worth noting that the OnePlus 5T’s camera module is a bit different than the OnePlus 5’s — it trades the secondary telephoto sensor for a wide-angle sensor — but the resulting image is more or less comparable. Here’s how to enable portrait mode. Tap the Camera shortcut in the app drawer, or press the power button twice. Select Portrait Mode from the options menu. When your subject’s in focus, you’ll see a Depth effect notification near the bottom of the viewfinder. Make sure you’re at least a foot away from the subject, but not further than six feet. If you’re worried you might not be pleased with the result, you can opt to save a normal photo along with the depth-adjusted one. Head to the Camera app’s Settings menu, scroll down to the Portrait subheading, and tap Save normal photo. One bummer about the OnePlus 5 and 5T’s portrait mode? It doesn’t support the front-facing camera. Luckily, there’s a workaround. More on that later. Thanks in part to a close collaboration with German lens and optics company Leica, Huawei’s supported portrait mode in some form or another for years, tapping software and dual-camera technologies to produce shallow depth of field effects in smartphone snaps. The Huawei P10 and P10 Plus, Mate 10 Pro and 10 Lite, Honor View10, Honor 9, Honor 7X, Honor 9i, and the quad-camera Honor Nova 2i are just a few of the phones in Huawei’s portfolio with portrait mode, and the Huawei P20 and P20 Pro, the newest to join the list, take things to the next level with triple-sensor rear cameras. Here’s how to get portrait mode on Huawei’s EMUI (Emotion UI) Android skin. Tap the icon in the bottom-right corner of the screen — you’ll a notification (“Artistic effect enabled“) indicating that you’re ready to move onto the next step: tweaking the bokeh enhancement level. Use the slider to adjust the depth of field effect. Tap on the subject you want in focus, and press the shutter button. The Google Pixel 2 and Pixel 2 XL portrait mode isn’t like that of other smartphones. It’s software-based — mostly. Both phones pack the Pixel Visual Core, a Google-designed imaging chip that can process a whopping 3 trillion operations per second and enhances the cameras’ Zero Shutter Lag (ZSL) and RAISR-enhanced digital zoom technologies, but the Google Camera — the system camera app which comes standard on the Pixel 2 and Pixel 2 XL — is platform agnostic. In fact, it’s been ported to a large and growing number of devices that includes the LG V30, the HTC U11, and the OnePlus 3T. Here’s how to use portrait mode on the Google Pixel. LG, Sony, HTC, and a host of other smartphone manufacturers ship phones without a native portrait mode. But there’s a solution: the Google Camera HDR+ port. The Google Camera HDR+ port is a modified version of the Google Camera app that’s preloaded on the Google Pixel 2 and Pixel 2 XL. Thanks to a few dedicated developers in the XDA community, it’s nearly blow-for-blow identical to the original, save a few features; the most recent version supports portrait mode, 4K video recording, RAW support, and electronic image stabilization. The Google Camera HDR+ works on most devices, but there are a few prerequisites. It’s not fully compatible with certain chipsets, namely HiSilicon Kirin and MediaTek system-on-chips. And it requires a phone that supports the Camera2 API, which can be enabled with Magisk if your device is rooted). Assuming you check those boxes, though, you’re good to go. For instructions on installing the Google Camera HDR+ and tips on configurations and settings options, check out our roundup.